To round off the holidays in a satisfactory and productive way, we sorted the boys' room. It's been a job which has been put off several times due to lack of interest, motivation and courage. It was tackled with groans but ended up being a job well done - who knew they had soooo many clothes in their cupboards? Hand-me-downs get passed on and the boys duly store them away without seeing a need to make space to accommodate more items, or sort through things and get selective. Consequently we managed to extract probably two thirds of their wardrobes. In truth, boys generally only need about three shirts and two pairs of pants, and as many pairs of underwear as days in a week. They tend to wear their favourite things repeatedly with little care of the items' cleanliness. They have also outgrown many of their toys, so we encouraged an overhaul in thinking and a generous attitude in giving. 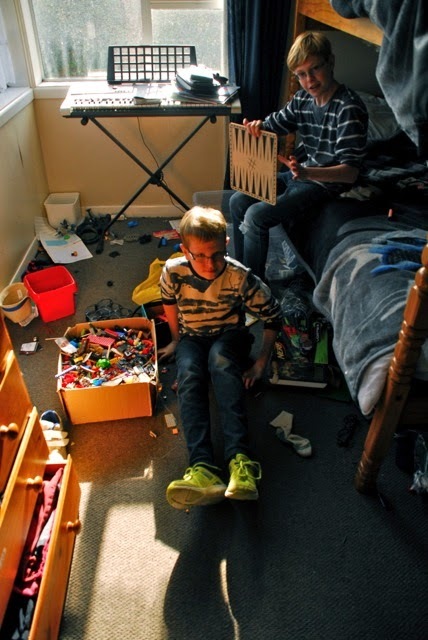 They are very happy to have whittled their stash down to mostly Lego and a few other items. I am very happy that there are definitely no more dirty socks under the bed.